The promise is printed across the front face: this Gift Card Mall Makes Great Gifts Simple. The selection is quite extensive, all oriented toward dining out and Hospitality Retail including Starbucks. Applebees. Subway, and even Whole Foods. The masthead design resembled a wrapped Gift Box with bow to communicate the offering more quickly from a distance. 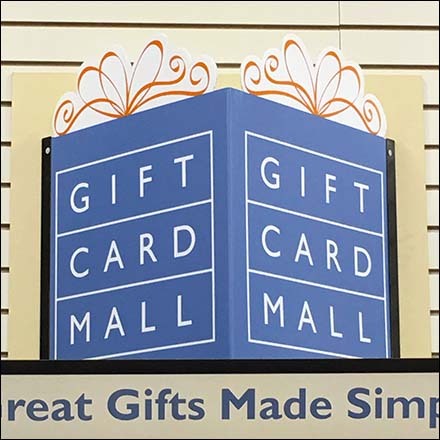 This Gift Card Mall Makes Great Gifts Simple was a cross sell within Michaels where craft Gift Cards are also on offer.